[caption id="attachment_1619" align="alignleft" width="225" caption="As part of a settlement with a cereal manufacturer, the NCL organized the delivery of close to 100,000 boxes of cereal to the Capital Area Food Bank. "] [/caption] By Sally Greenberg, NCL Executive Director Monday afternoon, NCL staff paid a visit to the Capital Area Food Bank, the Washington DC area’s largest food distribution facility. With me on the visit were Courtney Brein, our Linda Golodner Food Safety and Nutrition Fellow, Daniel Dahlman, our new communications associate, and Karen Marcus, of Finkelstein Thompson, the law firm that represented NCL in the suit. NCL’s connection to the CAFB stems from NCL’s case against a cereal manufacturer for false and deceptive advertising. The case settled in 2010, and as part of the settlement, NCL arranged to have 96,000 boxes of cereal delivered to the food bank for distribution throughout some of the poorest neighborhoods in the District. We didn’t know this at the time we negotiated this contribution, but the CAFB told us that cereal is in great demand because it is so expensive, and having cereal in this volume will delight food bank clients. Lynn Brantley, the CAFB’s renown Executive Director and one of the bank’s founders, greeted us at the entrance. She described how the bank got its start in the 1970s as part of an interfaith campaign drive to address hunger in the District. 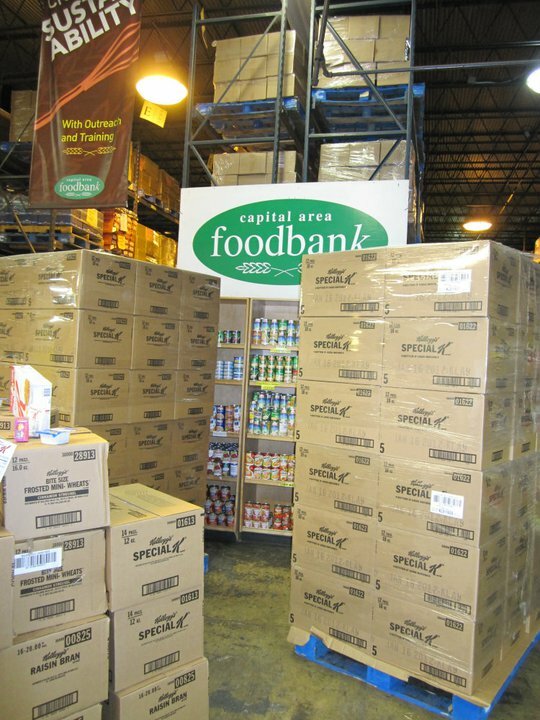 The CAFB then distributed 1 million pounds of food a year; the facility has grown by leaps and bounds since then, serving 700 distribution facilities in the metropolitan area, including food pantries, soup kitchens, child care providers, faith-based organizations, group homes, senior centers, shelters and youth programs. Today the bank distributes 28 million pounds a year of food, including a great deal of fresh produce. What I found most interesting were the pre-packed bags of food intended for school children and seniors. CAFB’s Molly McGlinchy, who led us on the tour, told us that a lot of kids whose families run low on money toward the end of the month may get breakfast and lunch at school, but they’ll miss an evening meal. They are sent home over the weekend or at night, therefore, with a bag that includes a box of spaghetti, cans of green beans and pears and peaches, and a big jar of red pasta sauce. The seniors’ package contained similar nutritious foods. In addition to the donations the CAFB receives, the bank also buys food at reduced rates from retailers. We saw food of every description – cans of Vienna sausage, canned chili with and without meat, peanut butter, cake and brownie mixes (very popular!) even vitaminwater! NCL is proud indeed that our efforts to prevent false and deceptive advertising in the cereal marketplace resulted in this bountiful contribution to the Capital Area Food Bank. The visit today to CAFB reinforced NCL’s historical connection to those in society who suffer from hunger and poverty. We were really so pleased to be able to direct nearly 100,000 boxes of cereal to those in greatest need of nutritious food.